To say that a heap of broccoli makes it way through my kitchen every week would be an understatement. Not because it’s my favourite green vegetable (a title firmly held by brussel sprouts), but because broccoli is such a nutritional powerhouse. I aim for a broccoli fix most days – not just for myself and my husband but for our dogs, Enzo and Vespa (who enjoy broccoli as part of their homemade raw BARF diet). Why is broccoli so remarkable? having ‘twice the vitamin C of an orange and nearly as much calcium as whole milk, with a better rate of absorption’. being ‘a good source of vitamins A and K. It contains several B vitamins, as well as iron, magnesium, potassium, selenium and zinc’. And there’s more – broccoli is a member of the brassica family, a group of vegetables that includes kale, cabbage and cauliflower. Studies have found that a high consumption of brassica vegetables is associated with a decreased risk of cancer. This is thanks to anti-cancer compounds in broccoli and other brassicas which include glucosinolates. In my mind there are two possible answers to this question. Firstly if you’re keen to reap the full nutritional benefits of broccoli, especially those anti-caner compounds, then broccoli should be eaten pretty close to raw. Ideally this means steaming florets of broccoli for less than 5 minutes. Or another simple method involves blanching broccoli florets for 10-20 seconds in boiling water, before rinsing them in ice cold water to stop the cooking process. The second answer? 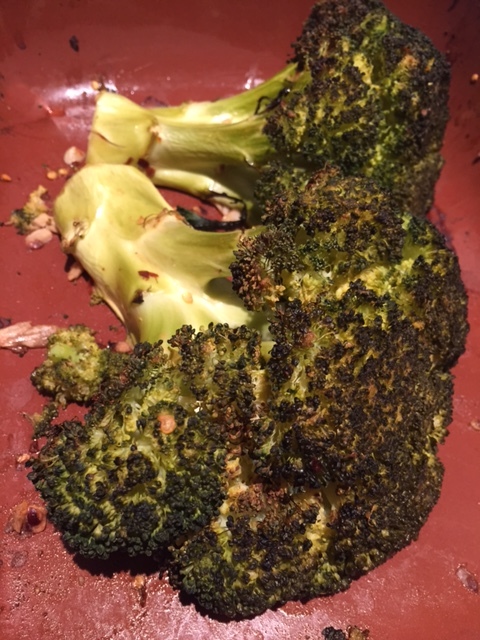 For those times when you want a very tasty and impressive end result try roasting spice coated broccoli whole. Using this method the fibrous stem is retained and the florets become crispy and charred. Grab one large whole head of broccoli, give it a good wash and set aside to dry. Combine 1-2 tsp of spices (eg cumin & chilli), 1 tbsp of coconut oil and 1/2 tsp salt. You could also squeeze a little lemon juice and/or chopped garlic into the spice mix. Leave the broccoli head whole or slice it in half right down the middle. Massage the coconut oil and spice mix into the piece(s) of broccoli. Add the broccoli into the oven and cook for 25-30 minutes at 180C. It’s ready when the stem can be easily sliced and the florets are nicely charred. If you’re looking for other ways to make brassica vegetables extraordinary then check out my posts for whole roasted cauliflower , spicy homemade sauerkraut and Indian cabbage thoran. And I’d love to know, what’s your favourite brassica vegetable and how do you cook it? Tags: benefits, brassica, broccoli, roasted. Bookmark the permalink. Have you tried peeling the larger stems? I find that makes a tremendous difference. I almost prefer the stems to the florets. Hi Liz – no I haven’t – I have been reading so much about the fibre in the skin of vegetables that I’m now cooking most things ‘skinned’- but I’ll give it a go next time – thank you! My favorite way to eat broccoli is raw in a salad. It is one vegetable that I don’t like overcooked at all. Roasting is always a good choice for any veggie but broccoli has to be eaten once cooked – not good for leftovers! Hi Aunt Juju glad you’re a fan of raw broccoli and I agree overcooking can lead to a soggy outcome! Absolutely love broccoli, Laura. Great post – always knew it was incredibly nutritious but now I have the full lowdown! Thanks Tracey – with this extra info now you can give yourself a big pat on the back with every mouthful of broccoli! 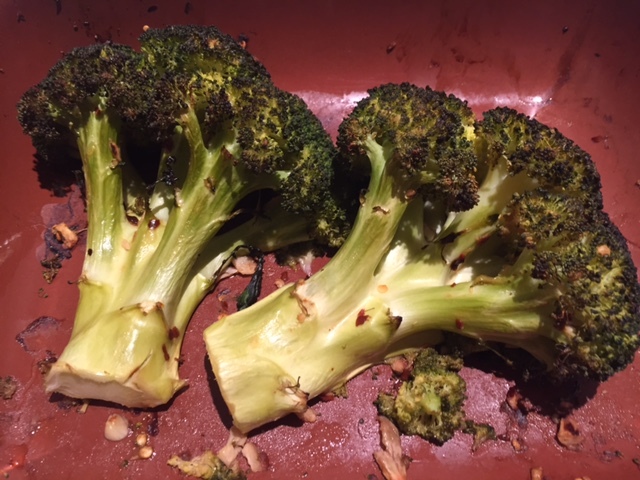 Roasted broccoli is one of my favorite vegetables too Laura! There is something so yummy about the crisp charred florets. I generally use olive oil with the spices but am going to use coconut oil like you did, the next time……I have to go get broccoli now! 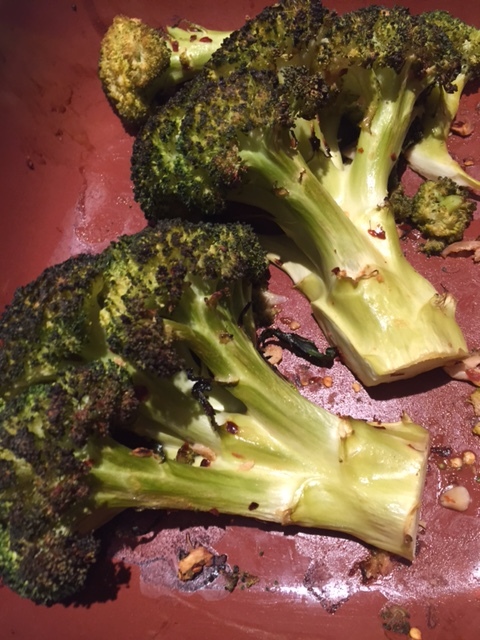 Hi Sandhya – yes you hit the nail on the head as they say – it’s the crisp and charred florets that make the roasted broccoli so good. I tend to use coconut oil over olive oil for cooking at high temperatures – but I don’t think it changes the end flavour…..
Yum! That looks like a good way to add flavour!